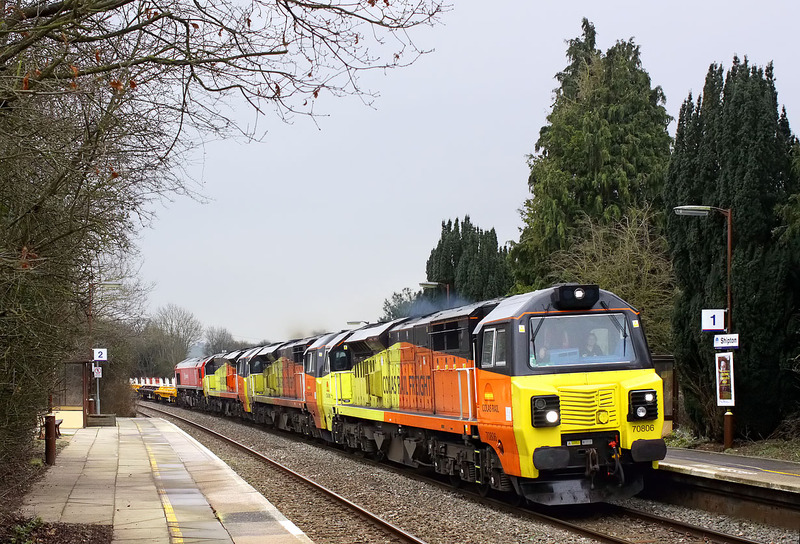 An impressive cavalcade passes slowly through Shipton station on 5 February 2015. 70806, 70808, 70805 & 59201 head the 6Z50 12:46 Hinksey to Bescot engineers train through the diminutive Cotswold Line station, bringing the welcome opportunity to photograph something other than a HST or DMU at this location. The landslip at Harbury resulted in this train being diverted via the Cotswold Line, this section of which does not normally see any freight trains. This is one of those occasions when a dull day, with no chance of the sun peeking out unexpectedly is required, as this picture is taken from the north side of the line. I particularly wanted to take the picture from this angle, to include the station nameboard.